Picture it. 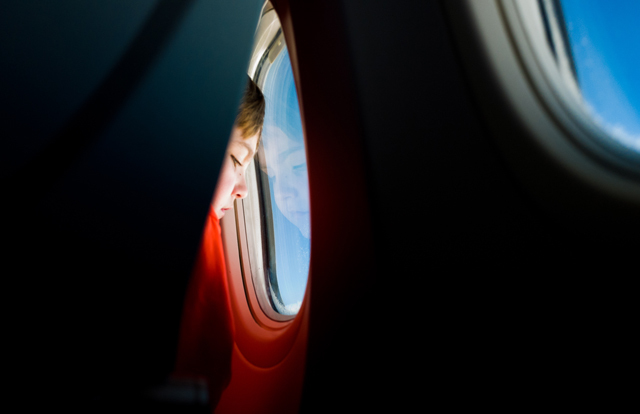 You’ve just settled in for a flight with your children, and all your electronic devices have given up the ghost. Simultaneously. The DVD player battery is dead, the laptop is kaput, the Nintendo has run out of juice and the iPad has well and truly checked out. Back-to-back episodes of the toddler’s TV obsession are therefore out of the question, as are all those apps you downloaded for your teenager. So, what do you do? Simple. You smile, with Zen-like calm, and reach for your Bag of Things. Because you read this post before you travelled, bookmarked it, and came prepared with an arsenal of cheap, screen-free activities for the journey. There are no batteries to run out, no precious screens to smash, and no wires to get tangled up in your hand luggage. 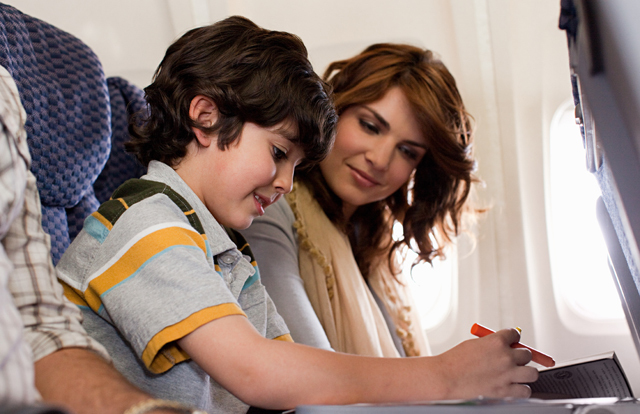 So you can sit back, relax, and enjoy your screen-free flight with kids like a pro. You’re welcome. Stickers stick. To everything. And that’s exactly why they’re so perfect for the plane – there are no little bits to lose, or drop repeatedly in the footwell. Usborne do a great range of holiday and airport-themed sticker books. And the appeal isn’t limited to toddlers – there are plenty of options elsewhere for older children too, from Minecraft to Star Wars-themed. These days, colouring books are just as much for adults as kids. If you’ve got older children or even teenagers, pack something like Lonely Planet’s Ultimate Travel Colouring Book and you may well be fighting over it. And if you’ve got toddlers and you’re worried about them getting pen everywhere, have a look at Crayola Colour Wonder books. They come with pens, so you don’t have to remember to pack them, and they’re specially designed to only work on the pages of the book. Neat… literally. Avoid having to bring pens or pencils at all, and get a travel-sized etch-a-sketch pad. The little stylus is attached by a string, so your little one can’t lose it. And once they’re fed up of their masterpiece, they can wipe it clean and start all over again. You know that game where you write names on Post-Its and stick them to your forehead so you can guess who you are? It works a treat for kids on the plane and all you need is a bit of imagination (plus Post-Its and a pen, obviously). Smaller children will enjoy playing with them long after the game is over. Plus, they won’t leave any mess – even if they do decide to decorate the seat-backs with them. Lonely Planet do a great range of books where every page is packed with interactive things to do, so it’ll be a decent amount of time before anyone says they’re bored. Try the Adventures In series for pre-schoolers, Spot The Lot for kids aged five and up, and the Not For Parents range for older kids and pre-teens. They’re all travel-themed, naturally. 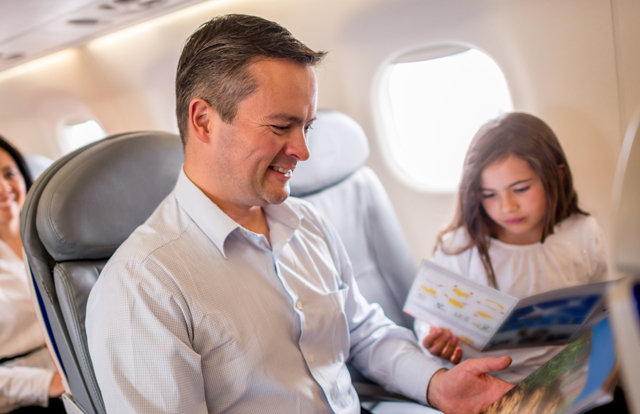 You don’t need to pack glue and paint to get crafty on the plane – there are loads of craft activities that are mess-free. ELC’s Sew and Lace cards are ideal for travel as they’ll keep toddlers and young children busy without any fuss, plus they’re super cheap. And Robots to Make and Decorate is another glue-free option aimed at older kids, which is all flat-packed in a handy book. Loads of classic games come in travel-friendly sizes. Pack a mini Guess Who? for younger kids or Uno cards if your children are a bit older and you can play them on holiday too. Plus, 50 Fun Games For On The Go is a good one for ideas that don’t need any props. Even if each game only takes five minutes, that’s more than four hours of your journey covered. Put them to work before your trip, and get them making postcards. Take a blank pack and some pens, or buy a postcard book – there are loads to choose from. It works especially well for younger kids, who can help buy stamps and find a postbox once you arrive at your destination. Go old-school and pack an actual made-of-paper book for your pre-teen. Go for something you’d be happy to read too and you’ll save space in your hand luggage. Young adult novels like Divergent and The Fault In Our Stars are prime examples. Because, what better time to get started on that novel? For older kids, take a look at DK’s Write Your Own Book or Lonely Planet’s My Travel Journal to get them started. And don’t just leave it to the kids. Try this stylish option from Not On The High Street and pen your own travel adventures. One final thought for the desperate mums of toddlers. Pack a comb, some hair ties and clips and let them loose on your hair. It requires minimum props, many of which you may already have to hand, and the only downside is that you may look slightly insane. But you’re a parent, on a plane, with your toddler. Ergo, you’re allowed to. A freelance writer and editor with two kids, a coffee habit and a life-long dream of moving to Italy. I blog about family life and travel at There We Go, and write for various magazines and brands via katiegregory.com.